If you’ve been happy with your Isuzu vehicles all these years, why not assure yourself of an even more delightful motoring experience in the future with one of the world’s most trusted and reliable vehicle brands? 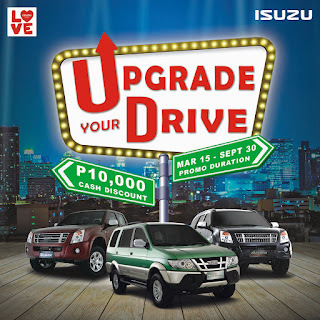 Starting today until September 30, 2019, Isuzu Philippines Corporation offers its “Upgrade Your Drive” promo to private individual (non-fleet) owners of Isuzu vehicles to make it even easier for them to own any of the brand-new variants of the Isuzu D-Max pickup or Isuzu mu-X SUV. If you own any of the following Isuzu vehicles, regardless of year model or variant: Gemini, Hi-Lander, Fuego, Trooper, Alterra, Crosswind, D-Max, and mu-X, head on over to your nearest Isuzu dealership. Valid LTO Official Receipt (OR) and Certificate of Registration (CR) that reflects your name as original owner of the vehicle, and two valid IDs. 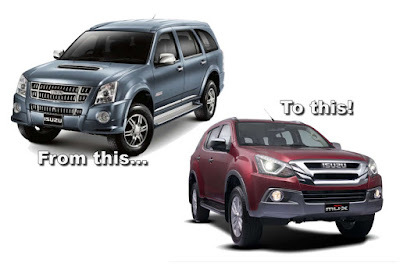 If you bought your Isuzu vehicle from a previous original owner, then bring a valid OR/CR of the vehicle that already reflects your name, or a notarized deed of sale/transfer if the vehicle’s OR and CR is still under the original owner’s name. Upon verification of your documents, the Isuzu dealership can then qualify you for a P 10,000 cash discount on your next purchase of any brand-new variants of the Isuzu mu-X and /or Isuzu D-Max (except Cab & Chassis). This cash discount is on top of any other existing promo or discount schemes your dealership may give you during the promo period. wow, what a "big" discount. Yes, 10,000php for all the hassles they require. Thanks, but no thanks. What in the World is WLTP? !